The Texans beat the Cowboys with a field goal late in overtime in Week 5. There’s been a lot of that. When Dak Prescott’s improbable pocket escape and 44-yard heave set up a field goal to tie Sunday night’s Cowboys-Texans game late in regulation, viewers were left with a familiar feeling: This game, like so many others this season, seemed destined for overtime. (Indeed, it did require OT — the Texans kicked a field goal in the extra frame to win 19-16.) It was the eighth overtime game of the 2018 season already — the most in the first five weeks of any NFL season since 2002, which also saw eight OT games. Along the way we’ve also gotten two ties, ensuring only the league’s fourth multi-tie campaign since it first introduced regular-season OT in 1974, and we narrowly missed three others thanks to game-ending scores in the waning seconds of the extra period.1 While the NFL still faces plenty of big-picture problems — and some fans are even lamenting the renewed prevalence of those dreaded ties — this wave of close finishes has mainly made last year’s complaints about boring football seem like a distant memory. The spike in overtime contests is just one element of this year’s extra drama. According to ESPN’s Stats & Information Group, 52 of the league’s 78 games this season have seen the trailing team sit within one score of the leader with five minutes left in the game — the second-most in any season through five weeks since 2001.2 Furthermore, 47 games this season have been within a score with two minutes left to play in regulation. It’s a perfect recipe for wild endings like Sunday’s Panthers-Giants duel — which saw two lead changes in the final 68 seconds of play — or last week’s Raiders-Browns thriller, with its four separate game-tying or go-ahead scores in the fourth quarter and OT alone. Anyway, all of this mainly speaks to the rise in parity across the league as a whole this year. Through five weeks, the Kansas City Chiefs rank No. 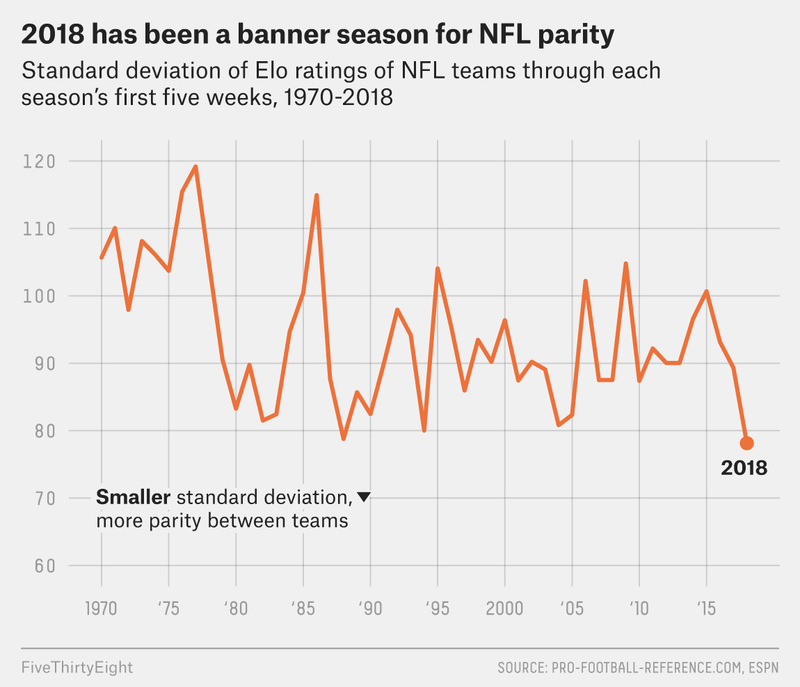 1 in FiveThirtyEight’s Elo ratings (our pet way of gauging how well a team is playing at any given moment in time), though their 1657 Elo isn’t especially high for an NFL leader at this stage of the season.4 At the other end of the rankings, the No. 32 Cleveland Browns (1344 Elo) are a lot better than the typical last-place team. You might say the Browns deserve better than 32nd place (I happen to agree), but choose an alternative — the Bills? Cardinals? Giants?? — and each has at least shown some signs of basic competency at various times this season. All of which is to say: The gap between the best and worst teams is not as wide as we’ve gotten used to it being. In 2011, 53 games met that criteria through five weeks. It’s the eighth-lowest rating for a No. 1 team through Week 5 since the 1970 AFL merger.